Story – Western Adelaide Community Residents Association (WACRA) Inc. | Community Alliance S.A. The Western Adelaide Coastal Residents Association (WACRA) is concerned with issues affecting the lives of those people living the corridor of land between Gulf St Vincent in the west, Tapleys Hill Road to the east, Bower Road (Semaphore Park) to the north and West Beach Road to the south. In the late 1990s the Olsen state Liberal government developed a plan to reverse the flow of the water and send it out via a huge storm water outlet known as the Barcoo Outlet, and to confiscate public land along the Glenelg foreshore and develop the private Holdfast Shores. To do this they also needed to move the boat launching facility at Glenelg and build a boat launching facility at West Beach . We set up a number of public meetings and a campaign committee consisting of over 20 residents. We established an intricate phone tree of over 600 residents who could be contacted through a structure that was led by the campaign committee known as the “Owls”. They would contact the 20 “Chief Pelicans” who in turn contacted the “Pelicans” and so on. We photographed and video recorded all of our actions including committee meetings, public meetings and non violent actions. Most of the campaign group were full time or part time workers who fronted up on 42 occasions to be confronted by the Police dragging us away from the main entrance blockade to the building sites. The Government used heavy double D trucks laden with massive stones to build the rock wall groyne to break the picket line and each time we physically protested we used different actions and events to attract and keep the media interested. The Campaign group maintained this protest action for over 6 months only to eventually have our hearts broken by the strength of the forces of the State and developers. The establishment say that we lost the campaign– we say that we created a community and life long friends who linked arms and fought against something they believed was wrong – and has since proven to be wrong. 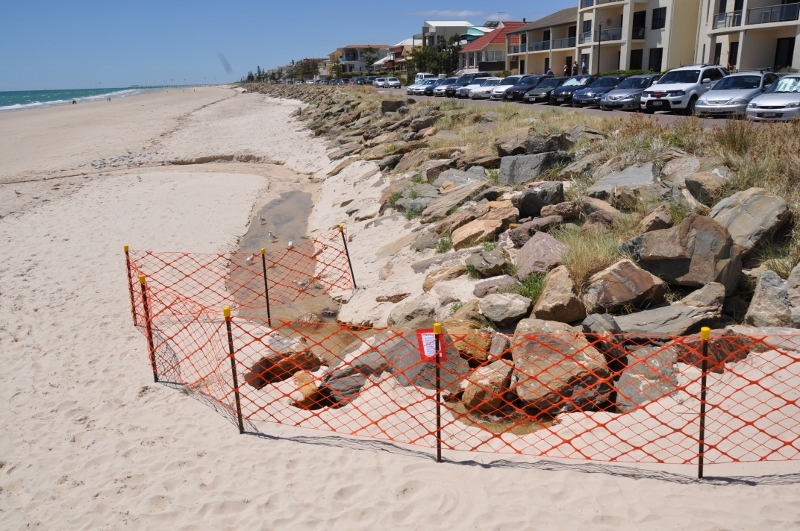 The system proved unable to handling large flows of stormwater and in 2003 flooding damaged homes in Glenelg North. 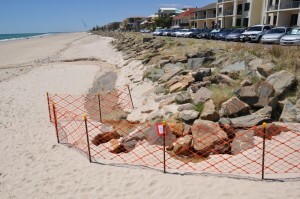 West Beach has become massively eroded and the state government continues to spend millions on dredging a channel that continually gets blocked by drifting sand and seagrass. The Baju/H2O residential and retail development at Henley Beach is directly opposite Henley Square; a very popular coastal setting that attracts many thousands of people to enjoy the waters of Gulf St Vincent and the relaxed lifestyle of the cafes and restaurants. However, now the Peoples Beach has changed forever as a result of a massive development consisting of two huge apartment blocks four levels high with two levels of under croft car parking providing over 60 apartments and 40 specialty shops known as the Baju and H2O. These developments have been done “through the back door” by using the ambiguity of the Planning Act and ERD Court to obtain decisions that are destroying the character and culture and social fabric of this idyllic place. This development had a third stage known as the Promenade that has been awaiting planning approval consideration from Council and consists of five levels in height and two levels of under croft car parking consisting of over 40 apartments and specialty shops. The development is located in a Historic Conservation Zone that is home to the iconic Ramsgate Hotel, the very first Municipal Tramways Trust purpose built building, the previous Henley Kiosk [now Thai Orchid] and other pre 1900 buildings either state or Local Heritage listed. The outflow on to the beach from groundwater pumped from the Baju building foundations. Several hundred litres is dumped on to the beach, every hour, every day. This development has caused damage to nearby homes due to pile driving which we were eventually able to stop. However it has not stopped the traffic management problems nor the destruction of a great place for our community. We have lost our local post office and currently excess groundwater pumped from the lower levels of the apartment complex gush across the beach day and night. The lowering of the water table creates a risk of subsidence of adjacent buildings and ingress of sea water into the local groundwater. WACRA has put our concerns to the Council’s DAP and to the ERD Court and on September 21, 2012, we learned that the developer has withdrawn his application for the Promenade development. This is a great result, but WACRA will stay very much involved in the development of future proposals for this crucial site.